I am so pleased to announce that after 27 weeks, my Fall One-Room Challenge will be completed this weekend. YAY! I purchased the Peppercorn paint and plan to paint over the weekend to finish up this space. I've made a few purchases for the countertop and wall decor and will reveal it all to you next week. But in the meantime, here's a peak at how the vanity looks. I just can't tell you how difficult this space is to photograph. You can see in the photo above how narrow the space is and I am at the other end trying to take a picture. Crazy small space. The area above the chair rail will be painted that beautiful dark color, Peppercorn. I purchased it from Sherwin Williams and chose their "Cashmere" paint as the base. I cannot wait to see how it looks on the wall. The wall decor I've purchased for this space is a mix of black and gold....two colors that will really make the Peppercorn pop! Remember I told you that you would be surprised at the final choice for the mirror? This is the original mirror and while it looked horrible with the pedestal sink, we are pleased with it for the new vanity. I still want to find one that has a little more pizzazz, but for the time being, this mirror works and will look so much better once the Peppercorn paint is up. I'm trying to stay under the budget I set for this room by using what I have. I've also been searching for a new light fixture but haven't found "the one" yet. When I find it, it will be installed and all will be right in this space. Now, on to the beer and champagne. The Spring One-Room Challenge is just around the corner and if I'm going to participate, I need to get a running head start. In our new home we have two guest bedrooms. We had furniture for one of those bedrooms, but the other bedroom has become a catch-all room for stray items in the house. I am ready for it to be a true bedroom. This room will not only be a guest bedroom, but it will also house the hubster's cigar humidor and his music equipment. The wall decor will be music related. So there's my starting point. You will have to visit tomorrow to see what ideas I'm tossing around for this room. I'm thinking about the next challenge too. Maybe a redo on one of our bathrooms. Redo meaning paint, new shower curtain, etc. Thank you and I don’t think we will either. It surprised me how much of a difference the vanity actually did make in this bathroom. I’m finding that it is wasted energy fretting over these things. 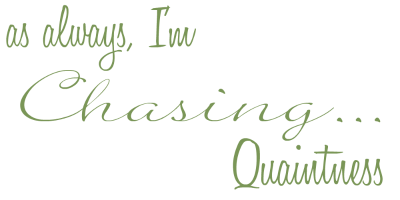 I think I will like it also and will leave it alone unless I just run across something that begs me to take it home….LOL. Thank you so much...it took flippin' long enough....LOL The vanity did make a difference...I'm looking for some different knobs for it also...since those were the "standard issue". So cool...I can't wait to see your bedroom and what changes you want to make...I think these challenges are fun and interesting, but our schedule is so crazy, it makes it so hard for me to stay on track! Hugs!! Peppercorn sounds like a color I would love. The reveal is highly anticipated. Donna, you would love the color. It is a deep, rich, dark gray...an HGTV color and the guy at Sherwin Williams said the Cashmere paint was wonderful! So pretty, Benita! I really thought you had gone out and bought the mirror for your classy new vanity. Sometimes the answer is right in front of our nose, isn't it? Peppercorn sounds lovely, can't wait to see it! Can't wait to see the top wall painted. Sounds so pretty! Are you considering a chandelier for the light fixture? That would be lovely! I'm looking forward to seeing how this paint looks on the wall also. I really want a chandelier in here. The light fixture is attached above the mirror, so I would have to swag it, which is no big deal. Just have to find one that isn't too terribly heavy! I hope I can find something beautiful for in here. Looks great! Yes, I do know. It's almost impossible for me to get shots in various places in my apartment. Thank you so much! It drives me insane when I can't get the shot I want...and the size of this bathroom makes it impossible! So frustrating! Love all the changes going on at your place...so beautiful!! I'm can't wait to see color on the wall! I like the mirror. I've painted the frames on my mirrors and my light fixtures many times to change up the look. I'm about ready for something new. Looking forward to your room challenge. Sounds like it's going to be fun. Thank you so much Sherry! I got the little half-bath painted this weekend. The hubster has to put up the new light fixture and the crown molding and this bathroom will be finished! I’m so excited to have it completed. And the dark paint color looks beautiful…can’t wait to share! :-) Hugs! Thanks so much! I was able to get the painting done this weekend and the Peppercorn paint made such a difference in this little room! I can't wait to show you all later this week! Hugs!! I think the Peppercorn will look delightfully dramatic and can't wait to see how it looks painted The vanity looks pretty and I so relate to how difficult it is to photograph a small room. 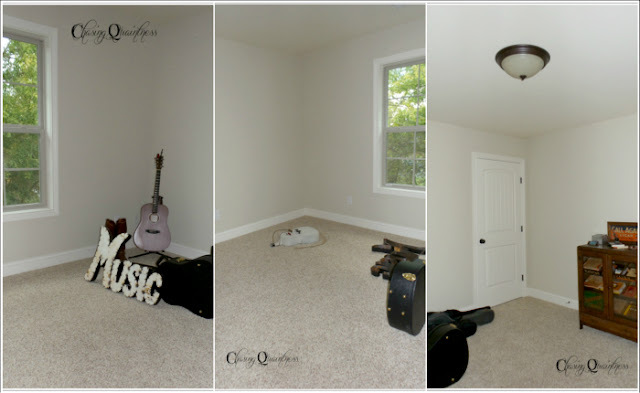 Your guest/music room sounds like it will be a fun project. I'll be back tomorrow to hear your plans. Vera, thank you so much! I was able to get this bathroom painted this weekend and the color is awesome! I love it…it has added so much drama and style to this unloved little room! :-) Hope to share later this week. I’m waiting on the hubster to put up the new light fixture and crown molding! Love and Hugs!! I think the mirror looks great and when you put that paint on the wall I think the simplicity will really pop and be so elegant. Love the vanity! Have a fun weekend...painting!! Thank you so much, I like the vanity sooooo much better!! The paint made such a difference and I'm so pleased with it. Waiting on the hubster to get the new light fixture and crown molding up and then I can show some pics! Hugs! Thank you so much! And YES, it has...LOL. This is the smallest space in my house and it has taken forever! :-) I was able to paint this weekend and am waiting for the hubster to get the light and crown molding up so I can take final photos! Hugs!! Love the vanity. Can't wait to see the new paint. Have a great weekend! Hugs!!! Thank you so much! 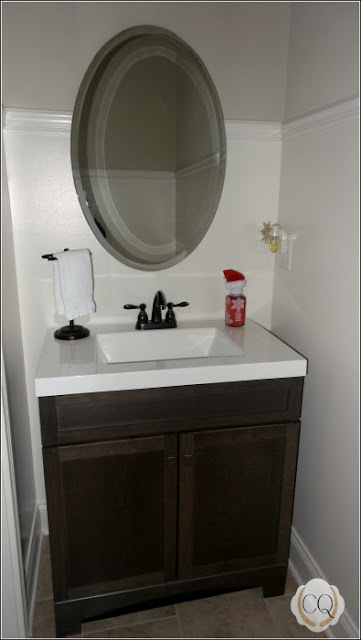 I love this vanity so much more than the non-functional pedestal that was in this space! I painted over the weekend and posted a "one-coat" photo on instagram. Love the color!! Hope you had a great weekend! Hugs!! I never heard of peppercorn paint, and wonder how it will look. 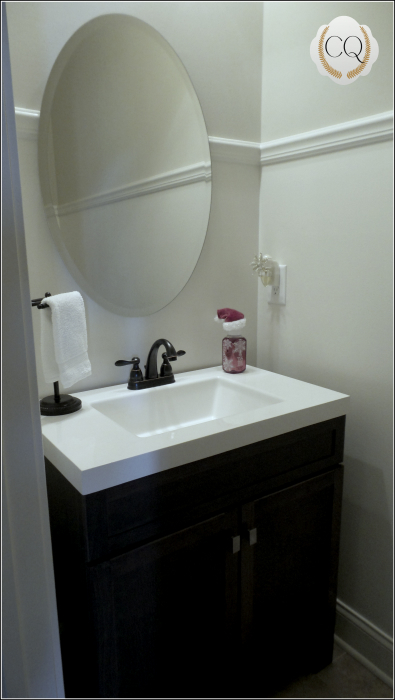 Looking forward to the reveal and the vanity looks great. Cathy, it is a gorgeous dark gray color. It is an HGTV color that Sherwin Williams carries. I painted over the weekend and the Cashmere paint looks gorgeous!! Can't wait to show everyone. Thank you so much!